5. Develop skills in identifying and/or participating in the clinical and/or research processes to address the problem of obesity and weight management. Meeting these goals will help prepare current and future health professionals who are equipped to address the problem of obesity and weight management from evidence-based, multidisciplinary and interdisciplinary perspectives that include nutrition, physical activity, behavioral management and counseling, environment, and policy perspectives. Students will complete five courses (15 credits) and one survey course (1 credit) for a total of 16 credit hours of graduate-level courses to meet the requirements of the Certificate Program. 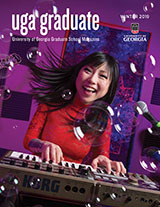 Students are degree seeking and must have completed an undergraduate degree from an accredited institution to be considered for admission to this Graduate Certificate program. The College of Family and Consumer Sciences, in collaboration with the College of Education and the College of Public Health, now offers a Graduate Interdisciplinary Certificate in Obesity and Weight Management. To begin to address the problem of obesity in Georgia, The University of Georgia launched its Obesity Initiative in 2011 with a focus on research and public engagement. It quickly became clear that there is a need for obesity-related education and instruction. Thus, this 16 credit hour Graduate Certificate program provides advanced training related to the prevention and management of obesity and obesity-related disorders for health professionals and practitioners pursuing careers in the areas of public health, policy, environment, counseling and behavior management, schools, foods, nutrition, dietetics, physical activity, medicine, pharmacy, nursing, and related disciplines. An interdisciplinary survey course will serve to integrate the major topics. Electives include a clinical or research course that will facilitate experiential learning for the students, or electives from other departments across campus. This program will permit students to tailor the focus of their course selections to their particular interest in obesity as health professionals and practitioners. For a complete and current list of applicable courses, please click here.